you will love it, and everyone else will, too! The home for the newest ropes challenge course and ziplines in the Boise, Idaho area. 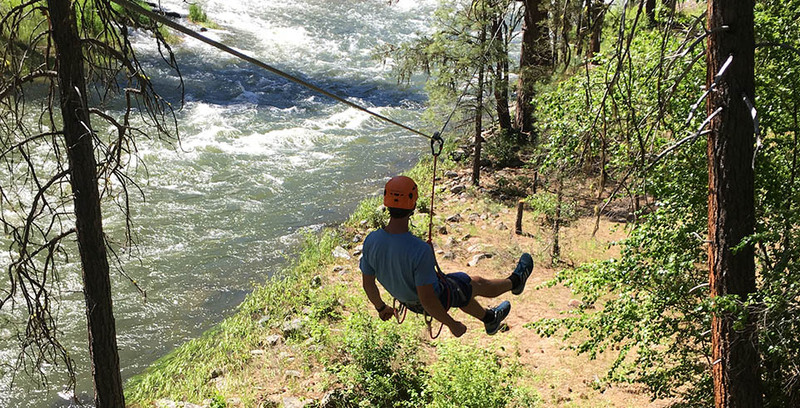 We offer 2-3 hour tours featuring our 13 element ropes challenge course nestled in the beautiful Idaho forest alongside the North Fork of the Payette River. Our ropes challenge course is a mixture of high rope elements and 4 exciting tree to tree ziplines. Looking for your next thrill? Bring your spirit of adventure we’ll provide the rest. 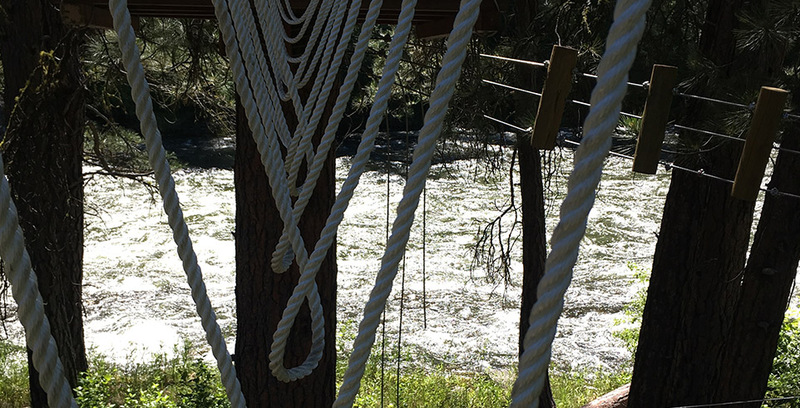 Located just 45 minutes from Boise, Idaho, our Welcome Center overlooks the Main Payette River. 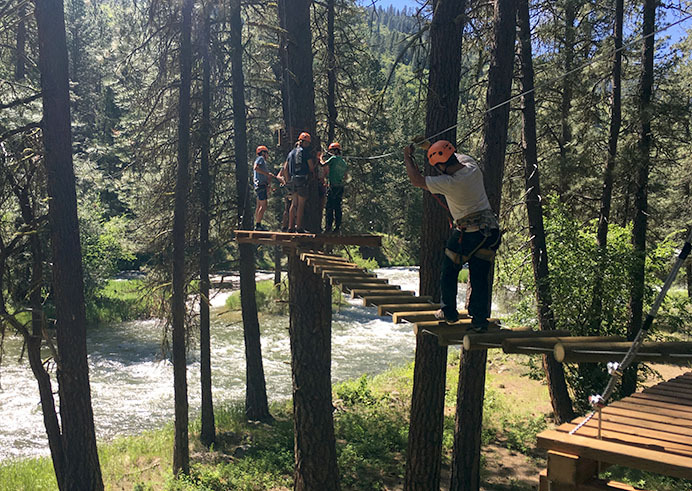 After checking in, we will whisk you the 11 miles upstream in an air conditioned Sprinter to the ropes challenge course, After outfitting you in helmets, safety harness, and gloves, trained staff will go over instruction.. Then, your tree- to -tree adventure above the forest floor will begin. 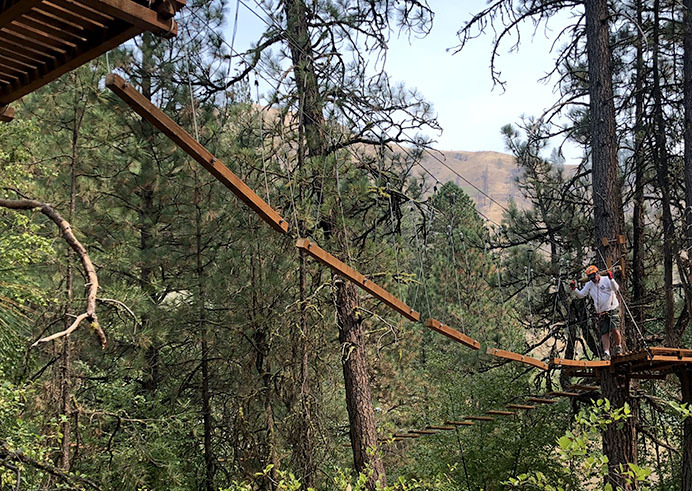 Climb, balance, swing, and walk through the trees while you challenge yourself with this daring experience with rope bridges, aerial tightropes, swinging log steps, and moving platforms to cross high above the forest floor. Our high ropes challenge present unending opportunities for self-discovery and team growth, emphasizing risk-taking, trust, and coaching. The challenges enable participants to expand their comfort zones and recognize fears that may block personal achievement. Fitness To take part in the tree top adventure course does require an element of fitness. The course can be physically and emotionally challenging. If you can climb a ladder unassisted, you should be fine. Participants must weigh between 60 and 250 pounds and measure at least 54 inches tall. All climbers must wear closed-toe shoes, have long hair tied back, and be free from loose-fitting clothing or jewelry.